I can’t believe it is May. The first five months of 2013 have certainly crept up on me, along with (much to my horror) a few extra pounds. Stealthily, one by one, the calendar pages for January, February, March, April and May presented themselves as did pizza, beer, wings, nachos and blueberry scones. And this is a problem because I am getting married in two months. Naturally, I’ve wanted to be a beautiful bride… a glowing picture of health in a stylish strapless dress to showcase an upper body that would make Michelle Obama proud (if not jealous). But alas, I’ve done nothing to accomplish my goal of slimming down. I can still remember stating my intentions to do ALL that I could to look killer for my wedding like it was yesterday… I was sitting at my cousin’s dining table on Christmas night, surrounded by family and slamming cheese cubes, chips and various chocolate-covered bits of deliciousness as I talked (with my mouth full no doubt) about how this was my LAST binge before I started being REALLY careful and intentional about my diet. Obviously, that plan crashed and burned along with my aspirations to be a size 2 again by summer. A friend took me shopping for wedding dresses mid-January and I refused to try anything on, claiming that it was futile since I would have a completely different body by June. Then February came… and went, as did March and April. With the turning of each calendar page, I would feel the squeeze a little bit more. My time to do something about this is rapidly shrinking. And unfortunately, it is the ONLY thing that has shrunk. I’ve never lost weight or gotten in shape on a deadline before. 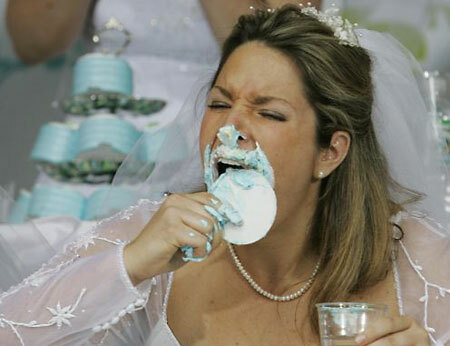 I seem to remember reading something that said it wasn’t very effective to try and lose weight for your wedding because the stress of planning along with the attempt to be trim and sexier could potentially backfire. No $#it. My ears are still ringing from the sound of it backfiring on me. Or is that the sound of my button popping off and shattering the window? I have been stressed. Not because of planning of the wedding actually, but for different reasons altogether. And I’ve learned that I am a stress eater. When I am happy and feeling at ease, I tend to make good choices and slim down. Conversely, when I am stressed and experiencing difficulty or uncertainty, I am lazy and eat bad food. I wanted so badly to be able to look at the photos from our wedding 20 years from now and think: “WOW! Was I a knockout or what!? !” But then last week it hit me. Twenty years from now I’ll be 58… and no matter what I look like THEN or whether I was a size 2 or a size 8 on the big day… I’ll STILL be wishing I was 38 again. I’m not getting any younger. I’ll never get 38 back. So I ought to enjoy it as I am TODAY. I should probably stop worrying about some idea I conjured of perfection (in a Christmas-chocolaty state of bliss and denial, no less) and buy a dress that flatters the softer, slightly-rounder me and just enjoy the ride. Or in this case… the walk. Down the aisle… toward my future. Yeah, seriously, it’s not worth stressing about. Get a pretty dress that fits and you’ll look great. Gowns can be magic like that. Thank you, Stephanie. 🙂 Going shopping this next week!! I will let you know how it all turns out! You will still be a beautiful bride. You look great. Thank you 🙂 And that is a GREAT point about looking at the pictures and saying “Hey! I’ve lost weight!” Everyone wants to be a beautiful bride… their MOST beautiful. But I know that comes from deep within the confidence and comfort of living in your own skin. Yes stop stressing about what you want to be. Be who you are now. Get the perfect dress that fits you now. You will be gorgeous and happy. Just live. Be happy. I’m talking to myself also sitting here with a spare tire. I still think I should be the size three that I was when I moved here. It’s not going to happen. So lets smile and get on with life! Thank you Linda! I am repeating your words like a mantra: “Be who you are now. Get the perfect dress that fits you now. You will be gorgeous and happy. Just live. Be happy.” Truly words for us (ALL) to live by! Wishing you the best:) I look back at the pictures of us together over the past ten years – gain weight, lost weight, look young, look old, look happy and in love is the BEST one of all!!! Awww… thank you JT!! I am hoping that is true. I know that only I can make that happen though 🙂 I was/am amazed at the number of people who have shared with me the whole “not trying to lose weight for your wedding because it will NEVER work” thing!! I tend to slim down when I am feeling little stress. My latest post that will be up on Monday helps explain some of that stress too. Ahh, there’s quite a bit of fodder here. For instance, although I of course didn’t say anything—it not being my place to do so—but since you’ve sort of mentioned it—I have noticed images of large New York pizza parties for two, and various other references on the weblog to scone-duggery. So, on the one hand, at 38, if you haven’t gained too much weight, perhaps you’re fortunate. On the other hand (and you must imagine Roger Rabbit saying this or otherwise you might get miffed) an unfortunate trend might be in the making. Two months, and then twenty years. Hmmm? Become Seinfeldian in your cereal consumption, with numerous daily bowls of oatmeal, and other filling yet slimmifying effects. Among my favs are Post Raisin Bran, Raisin Bran Crunch, Honey Bunches of Oats, and multigrain bread, toasted. Post Script: real milk is probably better than fake milk (aka “nonfat”). The real stuff fills you up. But whatever you do, I’m sure you’ll look fabulous! Wow. In another five days It’ll be a whole month since your last posting. Hope you haven’t lost interest in blogging. btw, I finished my outline. I have it offline and under wraps until it resembles a novel. Who knows how long that’s going to take. The easy part is over. Haven’t lost interest Donald. Just posting something again FINALLY. I am hoping June provides a little breathing room! Hope the novel is coming along well!! Since I have you online. Eh-hem. I was writing, and I noticed your comment. Stop by and take a glance at my plan. I have four related stories — a quadrilogy as it were — going on at the same time. It’s actually turning out to be a good idea, because making the outlines now saves me from having to adjust and tweak incongruities later.